As part of the EU efforts to create more world-class clusters across the EU by strengthening cluster excellence, the Commission launched in 2009, under the Competitiveness and Innovation Programme, the European Cluster Excellence Initiative (ECEI). To continue the successful work of this pan-European initiative which involved 13 partners from nine European countries ESCA - The European Secretariat for Cluster Analysis was established by one of the partners, VDI/VDE Innovation + Technik GmbH, to offer practical advice to cluster management organizations. Today, ESCA is a network of cluster experts from more than 30 countries. Clusters are complex and dynamic structures that are subject to continuous change. Strong clusters can promote economic growth through leveraging the innovation and business potential of a region. New employment opportunities, new products and services, new companies, new R&D activities and new patents can be the result of activities within a cluster. A professional cluster management can contribute to such a development through projects and services that tap into the cluster's potential. The European Cluster Excellence Initiative, initiated by the European Commission DG Enterprise and Industry, developed methodologies and tools to support cluster organisations to improve their capacities and capabilities in the management of clusters and networks. Being members of the European Cluster Excellence Initiative 13 project partners from nine European countries - all well experienced in the field of cluster management and support - created a uniform set of cluster management quality indicators and developed a quality labeling system for professional cluster management with the aim to get this methodology and proof of quality accepted all over Europe. ESCA supports cluster policy makers and programme owners with advice on cluster programme development. The European Cluster Excellence Initiative (ECEI) is looking to expand its network of Cluster Labelling Experts by providing new training opportunities to interested candidates. ECEI is based on a network of currently about 150 trained benchmarking experts from different European countries who conduct regular benchmarking activities. The training is open to all candidates expressing their interest and fulfilling the requirements listed under Point 4 of this Call for Expression of Interest. Interested candidates are invited to express their interest by sending an e-mail (with the required supporting documents) in English to ECEI-Benchmarking-Expert@vdivde-it.de. A European Consortium comprising 20 partners with a strong background in cluster development, led by VDI/VDE-IT, spent the second half of 2018 advancing the objectives of the Second Phase of the European Cluster Excellence Initiative (ECEI II). The ECEI II project is funded under the COSME programme and aims at developing a process leading to an improved European Cluster Labelling Scheme with a particular focus on a higher level of transparency, accountability and efficiency of the current benchmarking and labelling system. 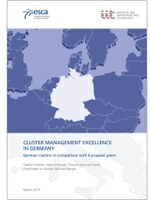 ESCA, the European Sercretariat for Cluster Analysis has just released the study Cluster Management Excellence in the Danube Region, dedicated to the current status of cluster management excellence in Europe, authored by Helmut Kergel, Dr. Gerd Meier zu Köcker, Michael Nerger and Dr. Oliver Ziegler. 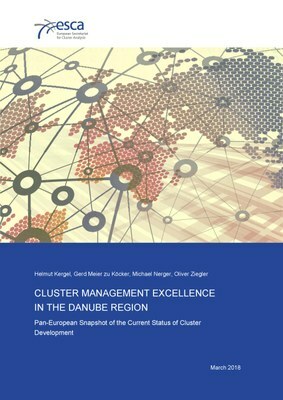 The study aims at contributing to the currently ongoing efforts made within ECEI II project to update and further streamline the Cluster Management Excellence and Labelling approach, as well as shading light on the current landscape within the Danube region, while illustrating the similarities and differences of cluster development in the Danube Region compared to the entire Europe. Please read about the distinction made by ESCA, for the purpose of this Pan-European cluster benchmarking exercise, between clusters, cluster initiaives and cluster organisations, about the European Cluster Excellence Management Scorecard, the indicators developed in the European Cluster Excellence Initiative, in the study available here. The study was published in Economy & Finance, on March 11th, 2018 and it is also made available in the attachment. 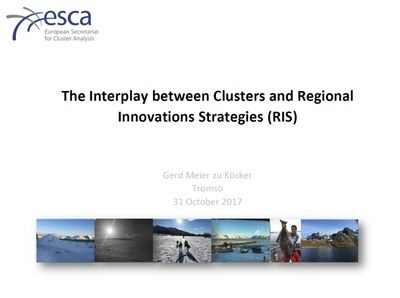 The Arctic Cluster Excellence Initiative (ACEI) is one of several regional initiatives ESCA is currently involved in. ACEI is a joint undertaking between the regional councils of Tromso and Finnmark in order to strengthening the role and impact of the six cluster initiatives, covering a broad range from Smart Construction, Bioprospecting until Experience industries. In cooperation with INNO AG we prepared a study on local and regional cluster hot-spots in the EU-13 countries. The study was commissioned by the German Federal Ministry of Education and Research. Based on the analysis of relevant statistics (such as the allocation of H2020 projects) and interviews the study idenified for each of the countries specific areas of strengths as well as relevant key stakeholders from academia and industry. The study can be downloaded here (unfortunately the study is available in German only). The new Smart Guide to Cluster Policy is a practical guide targeting regional authorities and stakeholders interested in "How to make better use of clusters for promoting regional industrial modernisation, supporting the growth of SMEs and encouraging smart specialisation". It is the latest publication in the series of Guidebooks on supporting SME policy from structural funds which was presented at the occasion of the Smart Regions conference. The Smart Guide explains what cluster and cluster policies are and what not, what makes them successful and why they matter. It presents eight Do's and Don'ts and showcases four Smart Cluster Stories, several cluster programme examples and practical instruments implemented by regions as part of modern cluster policies. This Guidebook is the result of the collaboration of the European Commission’s Directorate-General for Internal Market, Industry, Entrepreneurship and the Directorate-General for Regional and Urban Policy and was prepared with the support of the experts of the European Cluster Observatory. It provides input and guidance for the discussions and actions to be taken in the context of the launch of the Smart Specialisation Platform on Industrial Modernisation. The Smart Guide to Cluster Policy is currently available only in English, but will also be made available in most EU language. It is available here. To find out more about the partnering process, its wider context, potential benefits as well as how to express your interest, please see the full text of the call for the expression of interest. Within the framework of the United States – European Union Workshop on Clusters in Boston and Washington, D. C., November 17th -19th, 2015, NEWIN – The New England Water Innovation Network participated as the first US cluster organisation successfully in a Bronze Label Cluster Benchmarking Assessment of the European Secretariat for Cluster Analysis. The assessment was conducted by Thomas Lämmer-Gamp of ESCA and Merete D. Nielsen of Cluster Excellence Denmark. In a thorough discussion with the cluster manager, Karen Golmer, the network structures, strategy and services were examined. There will be a follow-up on the results to support the network with its further development. On September 15th, 2015 the Cluster Excellence Expert Group (CEEG) met in Munich to reflect together with the ESCA secretariat on the Gold label activities of the last twelve months. 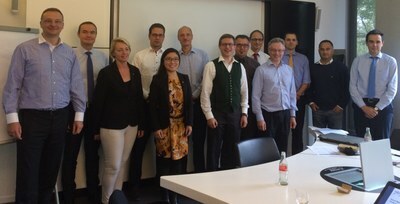 Following a discussion of results of different Gold label assessments the group also discussed the different opportunities to extend the period of validity of a Gold label as well as potential new activities Gold cluster managers can initiate together with the ESCA secretariat in Berlin. As new chairperson of the CEEG Per Spindler of “BioPeople – Denmark’s Life Science Cluster” was elected, he is supported by the new vice-chairperson, Philip Aldridge of the UK-based “North-East Process Industry Cluster (NEPIC)”. In the context of “Mexico’s Program for the Development for the IT industry of the Ministry of Economy – Prosoft” a cluster benchmarking activity of 13 Mexican IT-clusters was conducted in 2014. Aggregated results were compared to the aggregated results of ESCA cluster benchmarking activities of IT-clusters in Germany, Poland, and Spain. The public version of the results report can be downloaded in an English or a Spanish version. The paper was presented at the occassion of a workshop held by the European Commission DG Enterprise on September 23rd, 2014, in Brussels, to inform discussions on the EU policy agenda on cluster excellence. The paper presents insights that have been gained by the European Secretariat for Cluster Analysis from cluster benchmarking and quality audit. Please download the paper here. Given the increasing demand for information on the effects of clusters and networks, the Federal Ministry for Economic Affairs and Energy has launched the “Cluster Monitor Germany”. The “Cluster Monitor Germany” systematically monitors current trends in research- and innovation-focused clusters. The intention is to carry out regular monitoring in order to identify developments and draw conclusions regarding a potential need for action over a longer period of time. This brochure presents the results of the third survey round of May/June 2013.
technologies and increased globalisation has meant a striking shift away from traditional manufacturing towards services and innovation. Factory floors are progressively being replaced by creative communities whose raw material is their ability to imagine, create and innovate. […] If Europe wants to remain competitive in this changing global environment, it needs to put in place the right conditions for creativity and innovation to flourish in a new entrepreneurial culture. There is a lot of untapped potential in the cultural and creative industries to create growth and jobs." (European Commission, 2010: Green Paper – Unlocking the potential of cultural and creative industries, COM (2010) 183, p. 2). In this context the European Commission has launched the “European Creative Industries Alliance (ECIA)” in the autumn of 2011 to improve the integration of creative services, such as design, with traditional manufacturing sectors to add value and enhance the economic performance and robustness of European industry. Although there is agreement that collaboration between the creative industries and traditional industrial sectors results in cross-innovation of new products, services and processes, there is still no proper understanding of the mechanism behind. Being a member of the European Creative Industry Alliance (ECIA) Samoa – société d’aménagement de la métropole ouest atlantique – Quartier de la Création à Nantes has requested the Institute for Innovation and Technology (iit) to shed more light on the mechanisms that promote cross-innovation. A particular emphasis will be put on the instruments that can be used by local and regional authorities to promote cross-innovation involving both creative industries and traditional industrial sectors. For this purpose the study presents policy recommendations that in a sense present the “perfect programme” which provide the framework for the development of a “stress test” for existing approaches in terms of whether they already live up to the characteristics of such a “perfect programme”. The study is available at the website of the Institute for Innovation and Technology (iit), a parter of the European Secretariat for Cluster Analysis. 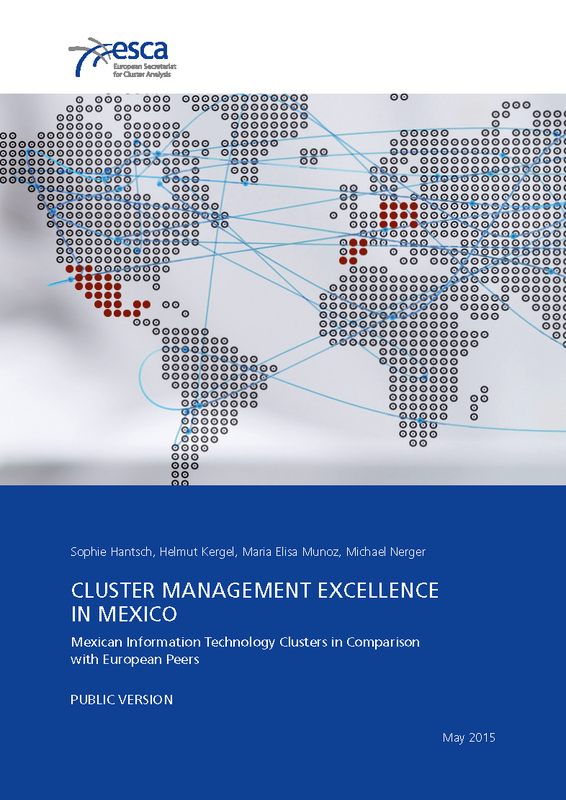 The study analyses how cluster programmes support cluster organisations with technical advice on improving management performance. The current study shall contribute to the upcoming discussion how to provide better support schemes for cluster management organisations (and their staff) striving for excellence. The time for such discussion seems to be right, since many regions and countries within Europe are facing next programme periods and might look to at proposals on how the future support function for clusters and cluster management organisations could look like. French Government published benchmarking report of ESCA that was prepared in the context of the evaluation of the French cluster programme "Pôles de compétitivité"
In the context of the evaluation of the French cluster programme "Pôles de compétitivité" ESCA benchmarked 71 cluster organisation that are supported under the scheme. For further information please see the website of the programme. The report can be downloaded here. ESCA is hosted by .